It was ticking up to a month without landing a fish, so with that in mind I got up at stupid o'clock this morning to have a bash before work. Water conditions were pretty poor and the weather was even worse, and without knowing where the fish were or being able to spot them in the dirty water I set about covering as much water as possible. I worked my way down the river spending 20-30 minutes in likely looking spots - and arrived at my last peg without a knock! Within about 10 minutes my rod started to tap round, really tiny knocks and just when I thought it was a crab something tried to rip the rod into the river. I winched it dead-weight to the net before it worked out what was going on and make a dash for freedom, great fight in the flood water - including steering it around a floating tree - before my prize was in the net. 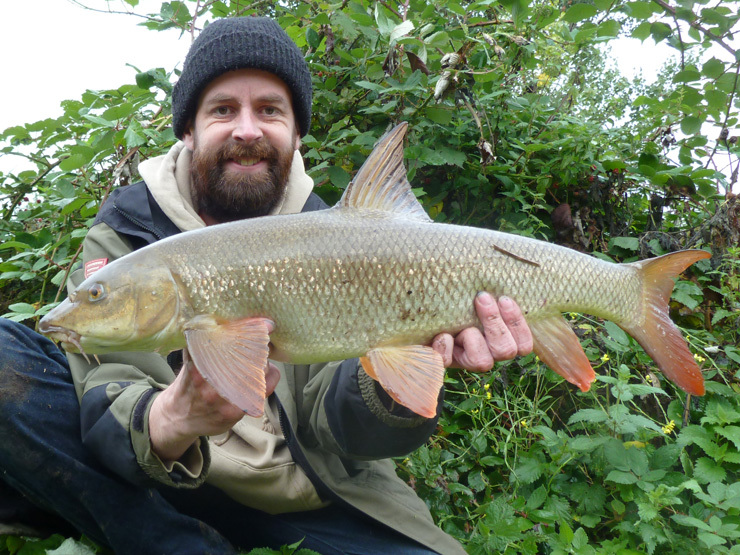 A cracking looking 7lb 6oz barbel to remind me what I've been missing out on this summer... Delighted! Congratulatións, very good barbel. I like this photo, the barbel colour is wonderful. I love it when they 'pose' with the fin up... Not a bad photo for a well out of practise self-take! 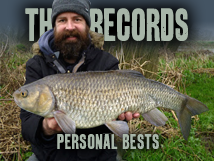 Not only a stonking great barbel but also a giant bushy beard. I'm jealous. How is the trade in fish fingers these days captain? How could I fail with a fisherman's beard like that? Cheers!